Cleveland now has an authentic Taiwanese restaurant, Phusion Cafe, which is located in the middle of the Superior Asia plaza (behind Superior Pho, towards the front door) in the old Mama’s Soul Kitchen location. The space is a little odd and lacks walls, but it makes up for the less-than-ideal ambiance by serving some killer food. 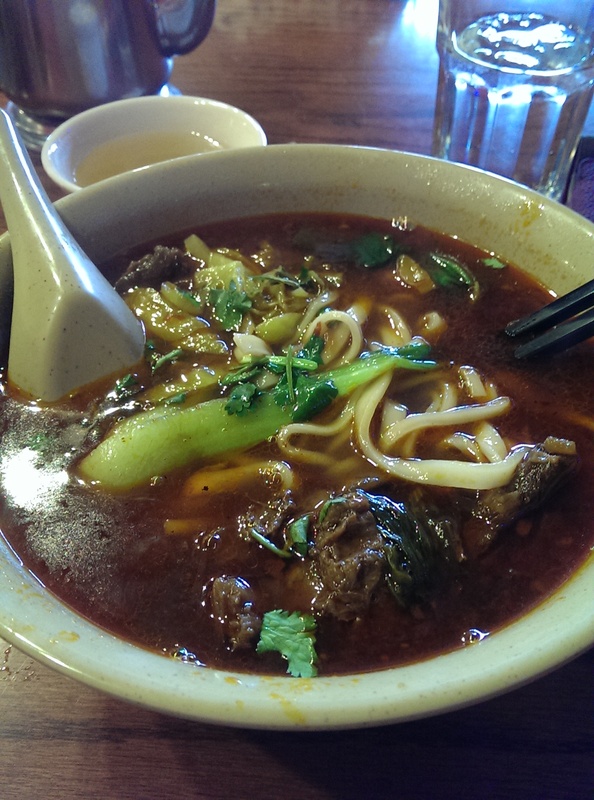 The most popular dish at Phusion Cafe is the Taiwanese Beef Noodle Soup ($7.95). The broth is very flavorful. It looks brown in photos, but it has a reddish cast to it. Because of the color I was afraid it was going to be spicy, but it was perfect. It actually has a slight pepperoni-like taste. The noodles (I upgraded my noodles for $1 more) were thick and a little hard to eat with a chopstick, so if you aren’t really adept with chopsticks swallow your pride and use a fork. I used chopsticks and ended up wearing a lot of it. The beef pieces were a decent size and fairly thick, yet tender. Overall I can definitely see why this is their most popular dish. When Map of Thailand was unexpectedly closed on the day I planned a dinner we tried to come up with a Plan B, and someone suggested Phusion Cafe, which had just opened. They handled our large table of 11 wonderfully considering we just showed up with no notice (something I never do). The server was pleasant and super competent. The group was full of vegetarians and non-pork eaters, and everyone left happy and full. I ordered mango iced tea, an egg roll and the Three Cups Chicken ($12.95). 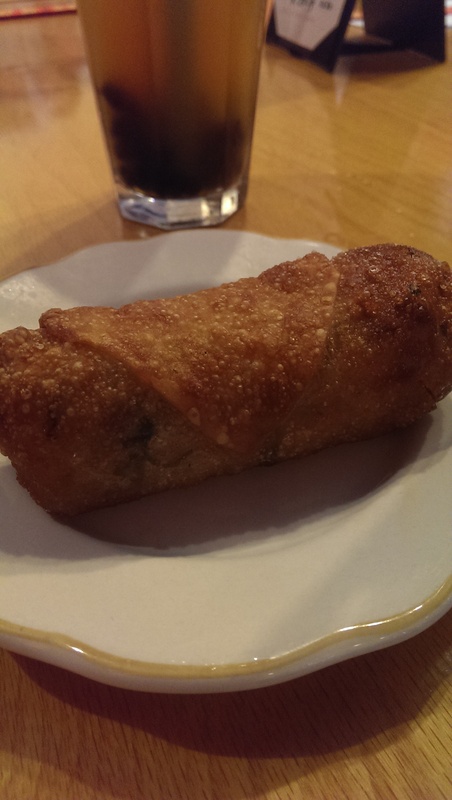 The egg roll was nothing to write home about. It was nicely fried and had a nice filling. The Three Cups Chicken was a bit unwieldy to eat since it had the bones still in, but it had a nice flavor. The chicken is cooked with fennel, whole pieces of ginger root, and basil, in a savory sauce. It was unlike anything I’ve had before. I already had a dining out event at Phusion Cafe booked a few weeks later with my dining out group, so we met up again and had an even better meal. 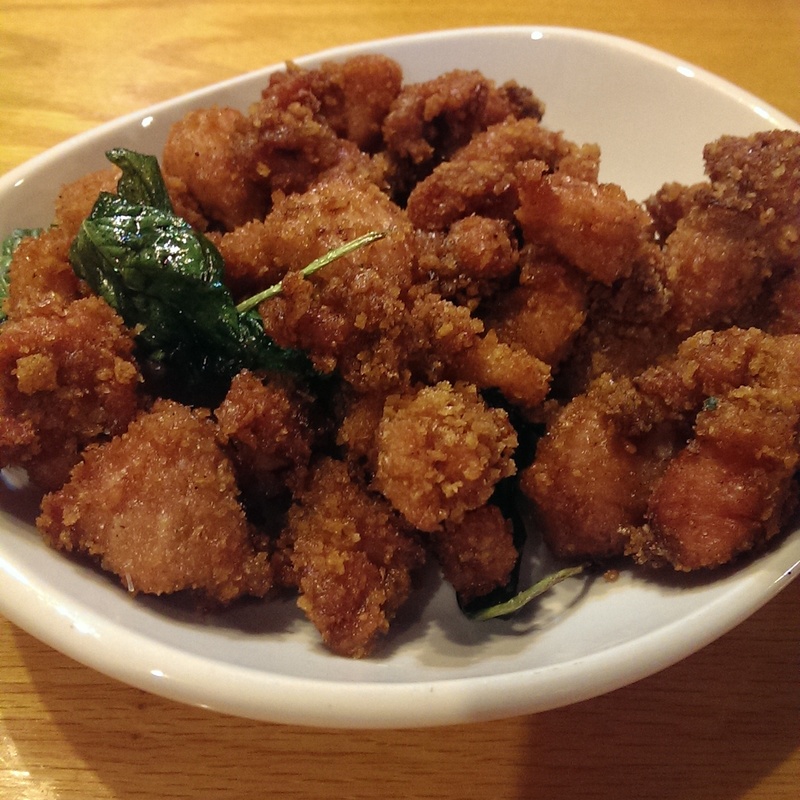 As mentioned in my Best Bites of 2015 post, the dish that absolutely astonished us and had us constantly reaching for more was their crispy chicken with fried basil. It was perfectly fried and extremely flavorful. My friend Nancy described it as “Chicken-Basil Crack.” I’m not sure if it is on their regular menu, but if you see it as a special do yourself a favor and order it. It was extremely addictive and makes a great appetizer. We ordered several different entrees that visit and shared them. 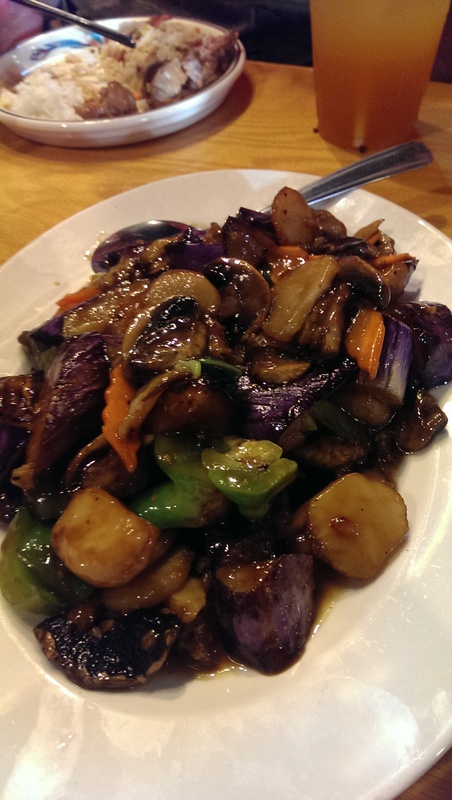 We ordered the eggplant with garlic sauce ($9.95) since so many of us are fans of the Chinese dish. 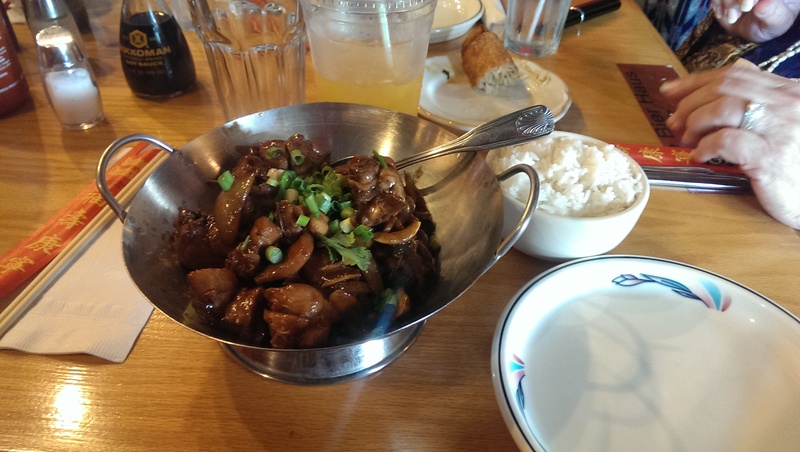 It was definitely on point and was very similar to other eggplant dishes such as Wonton Gourmet and Szechuan Gourmet. 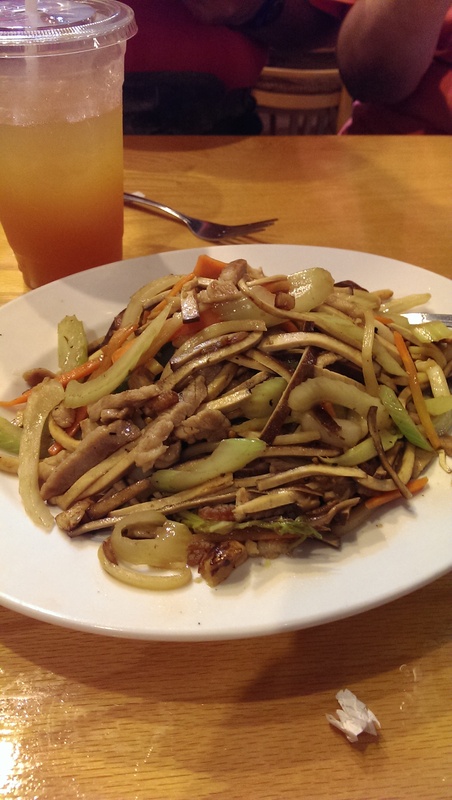 Another big hit was the hakka pork with tofu and celery. The flavor was really good, but it was really hard to eat with chopsticks. The thin little strips were difficult to wrangle. Again, don’t be too proud to ask for a fork. 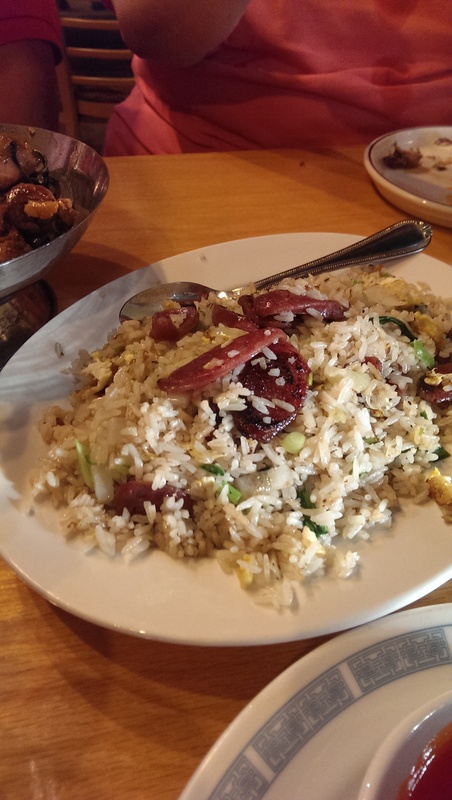 We also ordered the Sausage Fried Rice. Although several of my friends enjoyed this dish I wasn’t as big of a fan. I thought it was kind of bland. I was there recently for lunch and grabbed the Peanut Butter Chicken combination to go ($5.95 – the combo at dinner is $6.95). If you love peanut butter you will adore this dish. It was crisp fried chicken in a luscious peanut butter satay sauce. This is the chicken satay I have been searching for since I lived in Germany. The chicken was perfectly fried and still held up to reheating later. Now that I have had this dish I have to be honest and say I don’t think I will ever try anything else here. I still need to try the Peddler Noodles, but I can easily see the peanut butter chicken becoming an addiction. 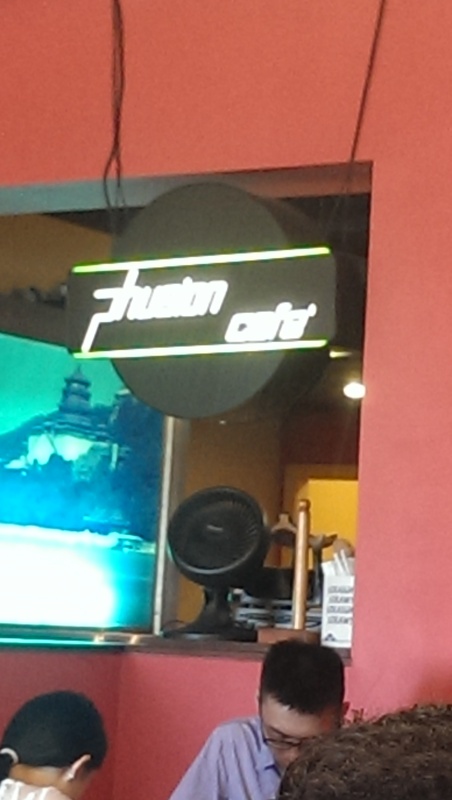 Overall, Phusion Cafe is in a weird location, but it is super cheap and super delicious. Give them a try.